I'm very pleased to join you for tonight's awards presentation ceremony of the 2017 Hong Kong Awards for Industries. My congratulations to the winning companies and organisations, as well as the entrepreneurs and visionaries who drive them. Their pursuit of excellence in products and in services helps power Hong Kong's economy and continuing success. As many of you know, I am no stranger to this event. I attended the ceremony in 2013, as Acting Chief Executive. And I'm pleased to be back as Chief Executive, back with a clear policy agenda for the future of Hong Kong. In my maiden Policy Address delivered in October, I emphasised the critical importance of innovation and technology to every aspect of our economy. 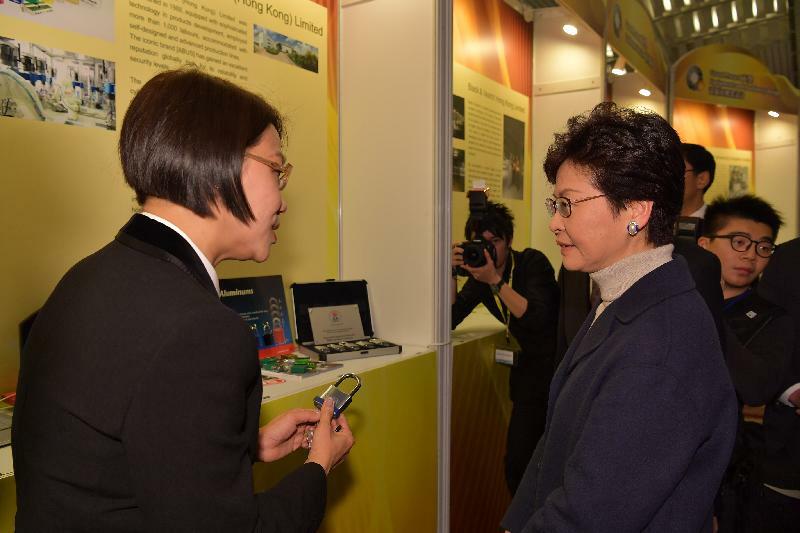 And in visiting the Grand Award winners' booths just a few minutes ago, I was delighted to see the application of Innovation and Technology realised not only by the winners of the Innovation and Creativity and Technological Achievement Categories, but also by winners in other categories as well. Design and creativity are also among my policy priorities, as I emphasised just 10 days ago at the opening of Business of Design Week. I believe in design and the creative industries in general – in their boundless ability to boost our economy, to add value to our products and services and the Hong Kong brand they burnish. Many of the winning entries tonight demonstrated creative excellence in their businesses, either in the products they've brought to bright life or in the services they've smartly packaged. 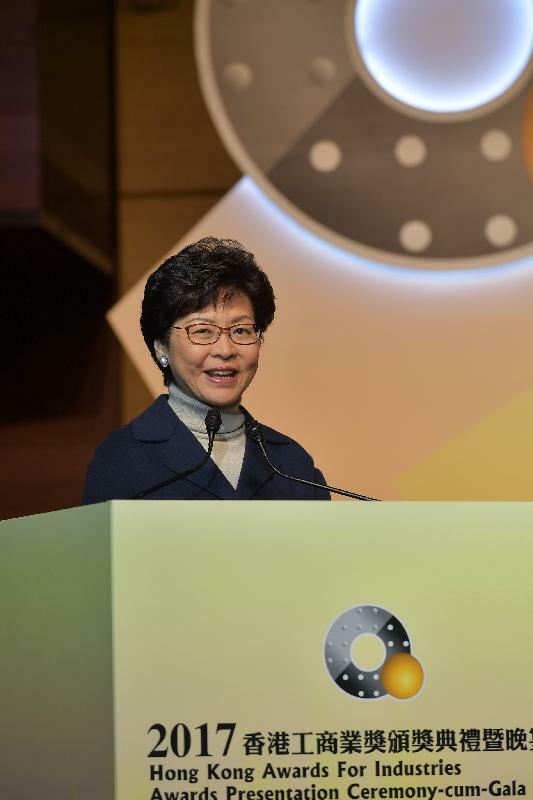 The winners of the Awards this year reinforce my belief that Hong Kong has a lot of potential to excel in Innovation and Technology and in creativity industries. My Government will ensure that resources and measures are in place to help Hong Kong realise its potential. I am personally leading a Steering Committee on Innovation and Technology and it has already commenced work earlier this month. The Steering Committee will oversee the Government's work in the eight areas I outlined in the Policy Address. Among others, we will encourage the private sector to invest more in R&D with the help of a tax incentive. Specifically, the first HK$2 million in eligible R&D expenditure will enjoy a 300 per cent tax deduction, with the remainder at 200 per cent. The Innovation and Technology Bureau is consulting stakeholders, many of you here included, on the details and its target is to introduce the Bill into LegCo in April 2018. Moreover, we will fund local companies to help them train their staff in advanced manufacturing. We have also rolled out a HK$2 billion Innovation and Technology Venture Fund Scheme. It's designed to invest, on a matching basis, with venture capital funds in local technology start-ups. It is now open for application until mid-January 2018. We're also working on a HK$500 million "Technology Talent Scheme" and we hope to consult the relevant Panel of the Legislative Council in March next year. In parallel, we plan to seek funding from the Legislative Council early next year in order to inject HK$3 billion into the Research Endowment Fund to aid local students admitted to research postgraduate programmes funded by the University Grants Committee. As regards the support for the creative industries, we will inject HK$1 billion into our CreateSmart Initiative, and the Hong Kong Design Centre will be given additional resources to reinforce Hong Kong's status as a city of design excellence in Asia. We will also work to boost ties between Hong Kong's design industry and Shenzhen and other design centres in the Mainland and overseas. I'm confident that will open up new markets for Hong Kong. Talking about new markets, Hong Kong products and services have long been renowned for their quality and market adaptability. I'm confident they can find success in new markets, especially those along the Belt and Road. I am pleased to tell you that, during my duty visit to Beijing last week, I have signed on behalf of the HKSAR Government an arrangement with the National Development and Reform Commission on Hong Kong's participation in the Belt and Road Initiative. The Arrangement covers a lot of areas and will allow Hong Kong to give full play to its unique advantages under "One Country, Two Systems" to contribute to the country, while at the same time seize those opportunities brought by the Belt and Road Initiative to provide new impetus for economic growth. We look forward to working with all of you here to maximise the benefits to be brought by the Arrangement. 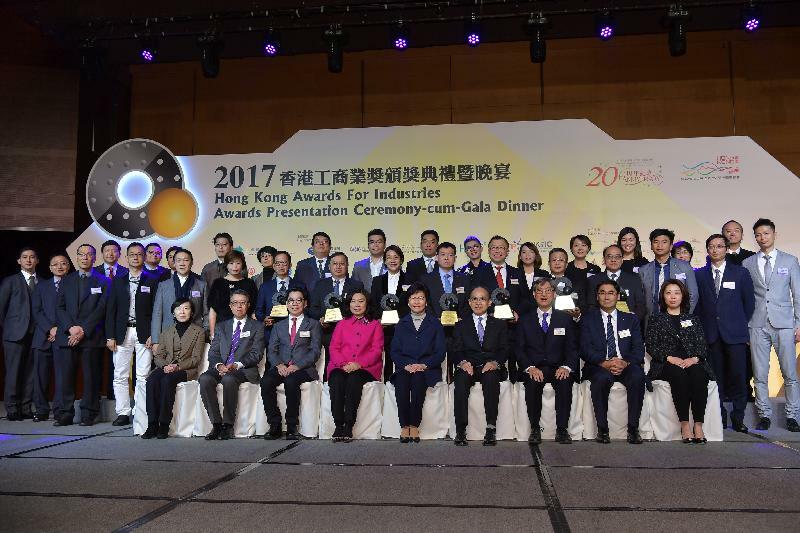 My congratulations once again to the winners of the 2017 Hong Kong Awards for Industries. My thanks to the Organising Committee, the seven organisers and the judging panels for their support in making the Awards a rousing success. I wish you all a Merry Christmas and a happy, healthy and rewarding New Year. Thank you.